NASA's Curiosity Mars rover conducted a test on Oct. 17, 2017, as part of the rover team's development of a new way to use the rover's drill. 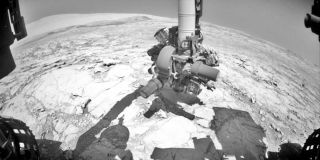 But the feed mechanism went wonky in December 2016, and Curiosity hasn't drilled a rock since. That's a big deal, because analyzing the powder pulled from the interior of drilled rocks is at the core of the rover's $2.5 billion mission. Such analyses have allowed the rover team to determine that Mars' Gale Crater — which Curiosity has been exploring since the probe's August 2012 landing — could have supported microbial life for long stretches in the ancient past. The team operating NASA's Curiosity Mars rover is developing techniques that the rover might be able to use to resume drilling into rocks on Mars. "The development work and testing here at JPL has been promising," Curiosity deputy project manager Steve Lee, also of JPL, said in the same statement. "The next step is to assess the force/torque sensor on Mars. We've made tremendous progress in developing feed-extended drilling, using the rover's versatile capabilities beyond the original design concepts. While there are still uncertainties that may complicate attempts to drill on Mars again, we are optimistic." his photo taken in the "Mars Yard" at NASA's Jet Propulsion Laboratory, Pasadena, California, on Aug. 1, 2017, shows a step in development of possible alternative techniques that NASA's Curiosity Mars rover might be able to use to resume drilling into rocks on Mars.